Anne Williams says she killed her best friend, Karoline. But did she? Or is there more to Karoline's mysterious death than meets the eye? Anne embarks on a compelling journey to discover her past and exposes an unusual history, horrific crimes and appalling betrayals. Through unexpected turns and revelations, Anne learns about love, family and who she really is. Can she survive the truth? Tricia: Welcome, Catherine. Can you tell us a little about yourself? Catherine: In 2002, I retired from a 35-year education career. Although I enjoyed the profession very much, my passion has always been writing. I did write some short fiction while working and had a few stories and poems published in small literary magazines. However, I didn’t have much energy for the longer fiction I wanted to tackle, both in terms of the actual writing as well as the submission process. I began my first novel as soon as the ink dried on my retirement letter. I’ve now written 5 books and several short stories, all of which have been published. My husband and I have lots of kids and grandkids combined, plus we live with two very spoiled cats. Catherine: I remember writing fairy tales for my classmates in Grade Three. I probably wanted to be an author from the first time I could string words together. In Grade 8, I wrote a speech about “What I Want to Be When I Grow Up” and it was about - being an author! I won first prize, too. Catherine: Sweet Karoline explores the mindset of a psychologically fragile character throughout a journey of self-discovery that involves universal themes of beauty, racism, love, treachery, family history, and crime. 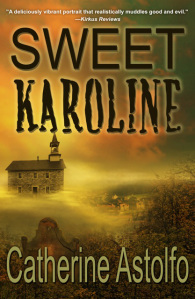 Catherine: There were several points of inspiration for Sweet Karoline. The first one is a theme that runs through all my books. I am fascinated by evil, by the psychopathology that leads people to harm others. How is a monster created? Are they born or developed? How can we recognize them? For Sweet Karoline, I explored that theme through the complicated relationship between two women. My second inspiration, which I have to admit also runs through my other books, is my children’s background. They are a combination of white, black and native ancestry. I find the history unique and intriguing, in particular the family’s undocumented connection to Joseph Brant. As for Anne, the main character, she was very strong and inserted her personality into the book right from the beginning. One of my children lives in Los Angeles, so I am somewhat familiar with that area and was inspired to place Anne in the film industry, as my children are filmmakers. Catherine: I think I'd have to say Sweet Karoline, because it's the most complex of all my novels and the most unique line of story telling that I've employed to date. My Emily Taylor Mysteries are a little more "classic". Catherine: I love Anne Williams, the main character in Sweet Karoline, because she is the most unpredictable, the most honest (sometimes brutally so) and a person you love and hate at the same time. I kind of admire that sort of cunning and truth. Catherine: The hardest part of writing Sweet Karoline was choosing a path for Anne, my main character. She kept resisting the storylines I gave her! Not surprising, since she’s a complicated, feisty, intelligent woman who is undergoing an enormous trauma. She has an emotional breakdown after the death of her best friend. Anne falls in love for the first time. She discovers a trail of manipulation and betrayal that would send anyone into shock. Naturally she was a little taciturn and resistant to her writer. As a result Sweet Karoline went through several permutations. The creative process for this one taught me a lot about patience. The novel developed very slowly in comparison to my other four, taking almost three years to complete. It was like the taciturn child after giving birth to several placid babies. I learned to let go. Follow my subconscious muse that was directing me away from the ordinary. When I finally gave in to that mode, it was exhilarating. I believe it has changed my writing forever. Catherine: My primary goal is write page-turner books that quickly draw the reader into the lives of my characters, so the reader cares about them, encourages them, feels compelled to follow them through their current puzzle, predicament, or life lesson. Catherine: I have two of them on the go, which is something I seem to do a lot (juggle more than one). One is a young adult mystery and the other is a cozy mystery about a retirement home. Catherine: Keep writing. Despite setbacks or criticism or self-doubt, just keep doing it. (If you are a “real” author, you won’t be able to stop anyway.) But it’s perseverance, determination and commitment that will make the difference between wish and fulfilment. In this day of e-publishing, go for it. If no publisher recognizes the worth of your novel, go ahead and put it out there to the reading public. Ask them to decide. Tricia: Thank you, Catherine, for stopping by to speak with us. For those readers who would like to learn more about Catherine Astolfo's work, please visit the following links. And, be sure to read the wonderful excerpt below. I met Ethan on the day that I killed Karoline. Other than a few minor adjustments, I believe that I have handled her murder exceedingly well. The state of my car, for instance, has become something of a nuisance. Bits of tissue, used napkins, paper cups and pop cans litter the floor at my feet or fly out the window as I drive along. I am invariably subjected to a barrage of honking whenever I reach a red light. People these days have no patience. They ought to understand that I am busy examining the stray bits in my car. Some of them are works of art. I don't notice the change to green because they are so infinitely interesting. This study of creative possibilities has become somewhat of an obsession. In the back of my mind I know that all I have to do is clean it up. Yet the thought of actually tackling the onslaught of debris leaves me inert and helpless. Ethan offered recently to take me to the car wash. He'd help me dump the debris and vacuum the inside, but I have seriously considered the idea that I may be destroying a future Picasso. I have thus far refused his proposition. Not that I have shared my vision of a Picasso with him, of course. I just say that I never have time. I have acquired a habit of going shopping. I make lists of things in my mind—groceries, toiletries, cosmetics, medicines, vitamins or clothing—that seem absolutely essential to the arrival of tomorrow. But once inside the pharmacy, the clothing store or the shopping center, the bright lights mesmerize me. My eyes blur and I can't for the life of me remember what I have come for. When I do buy something, I am left vaguely dissatisfied, certain that I could have gotten a better bargain somewhere else had I only looked a little longer. Depressed because I had to use my credit card again and this purchase will become just one more thing to do. Write the check. Buy the stamp. Walk to the post box. Mail the envelope. The little, unfinished things do sometimes bother me. Dirty laundry is piled up in the closet. The bed is always unmade. In the bathroom, the ceiling is slowly cracking from some unspecified leak that I have failed to report to the superintendent. The drapes in the living room neither open nor close anymore. At first I tended to watch television all night long, despite the fact that the next day I was a zombie. After I decided to go on an extended sick leave, it didn't matter. I started to sleep all night and all day, never moving unless forced to by some phone call, knock at the door or the call of nature. I spend hours at the sink. For some reason, the suds and the water are calming. So far I have washed every dish, bowl, and ornament in the apartment two or three times. I reenact advertisements for the latest dishwashing liquid, showing off my lovely long fingers and hands to, well, myself. I speak in a sing-song voice to the imaginary audience, telling them how kind the dishwashing liquid has been to my hands over the years, encouraging them to run right out and buy this product before it disappears from the shelf. After I've allowed the water to swirl down the drain, I shift to spending hours in front of the little mirror that hangs in my kitchen. People tell me that I am a very beautiful woman. On good days, when I feel haughty and happy, I can gaze into the polished glass and agree with their assessment. On other days, I notice the nose that's a little too upturned. The lips that protrude a bit too much. The dark birthmark above my left eyebrow. The ears that don't lie flat against my head. I have no idea why I am considered flawless, for I have many perceptible flaws, both inside and out. My father is white and my mother is black with some Native American thrown into her background. My parents have always bragged that I inherited all the great physical features of those races. Their perspective is far less critical than mine. They focus on all the positives. Naturally wavy hair. Large brown eyes with long curling lashes. High, full cheekbones. A small, pert nose. Lips just thick enough to be called luscious. I am one of those fortunate people who can eat all day and not gain an ounce. Thus I am described as tall and lean as opposed to thin. I have full breasts and a narrow waist. I am a fast runner and good at any sport I attempt. In Hollywood, I am considered full figured. My skin is a light brown, the color of coffee with cream I guess you would say, that makes me look as though I've just stepped out of a tanning bed. Heads literally turn to stare at me in the street, from across a room, or on the subway. Male and female. To me, it's a constant source of surprise, chagrin and exasperation. Lots of people, especially women, have jealously told me that I should be grateful for my looks. But I hate being identified as beautiful. Men tend to stare only at my chest when they talk to me. Or they show me off like some trophy and do not bother to ask my opinion on anything. I have been approached in bars and stores alike. Even in this land of plastic enhanced faces, I literally cannot go anywhere without being stared at or even followed. Most people, in fact, are convinced I am a movie star or model. These are not careers I've ever wanted. I have often been stalked, thus the three sets of locks on our door. Our telephone number is always unlisted and has to be changed once some obsessed man discovers it. When you are lovely on the outside, it's always difficult to entice people to look for the true person underneath. I'm learning through Ethan that it's exactly the same for truly ugly people. Over the years, I learned to live at the surface. It wasn't hard to do in Los Angeles, where even the air is insipid. I would prefer to be considered intelligent, but that's probably not an attribute anyone would mention when they speak of me. I worked very hard to acquire the position of Executive Assistant at Grace Film Productions, which is where I was employed up until last month. I was one of the very lucky ones who loved what I did every day and rarely considered it an effort. My former office is surrounded by windows and is fairly well designed. My desk is large and my chair comfortable. The office building, which houses Grace as well as several other companies, is an architectural beauty. All blue glass and steel, round and elegant, surrounded by greenery and topped with a beautiful grey crown that's actually an enormous rooftop patio. The front doors open with a swish. The security desk is classy, the carpet plush. The employees are welcoming and friendly. In the lobby and elevators, hushed music fills the air to calm nerves on the way to hear someone's decision on the success or failure of a movie script. Grace Films takes a script all the way from the editing stage to production. Sometimes my employers are heavily involved in the resultant movie and sometimes they take an Executive Producer role, basically handing the project off to other producers for the detailed work. My position requires juggling numerous prickly clients, writers, producers, and even actors, who are either nervous or over-confident artists. I also organize the lives of my bosses, who have enormous egos and expect everything to be done yesterday. I am able to handle details and disasters with a calm, objective exterior and an inner patience that stems from my adoration of talented people. Or, as Karoline would tell you, my love of power. I frequently go on set to distract or pacify our clients. I learn about their backgrounds, families, likes and dislikes, and treat them accordingly. Some of my employers have become my friends. Some of the writers and directors and actors are now my dependents. Great interview. I like seeing how authors put themselves and life experiences into their work.